Dunstanburgh Castle is in fact the largest Castle in Northumberland and today this windswept ruin - originally built in the 14th century during the border wars, can be located 9 miles northeast of Alnwick where it dramatically dominates the coastline from high upon the Great Whin Sill. The castle was built by Thomas Earl of Lancaster who although he was nephew to King Edward II, eventually lead a rebellion against the king after relations between the two had turned sour. Unfortunately for Thomas, he was captured and eventually tried for treason in Pontefract Castle then executed on the hill north of St John's Priory in a particularly gruesome manner. It is said that the executioner had not had enough experience and that it took him 11 blows to sever the head with the axe! 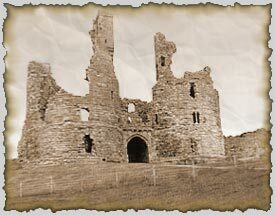 Not surprisingly the tortured ghost of Thomas, Earl of Lancaster is now said to haunt the ruins of Dunstanburgh Castle carrying his mutilated head! Another ghostly story from this fine mediaeval ruin is of a gallant knight called Sir Guy who went to shelter amidst there ruins of Dunstanburgh castle only to be confronted according to legend by a hideous creature dressed in white urging him to follow to where he would be rewarded by a 'beauty bright'. Sir Guy followed the figure up a winding staircase into a room containing hundreds sleeping knights and their horses and in the centre of the room a sparkling casket the in which lay sleeping, a beautiful maiden. Supposedly, on either side of the maiden were serpents, one holding a sword the other a horn and Sir Guy was told that he could wake the Lady but he must choose either the sword or the horn as only one of these objects would actually awaken her. Sir Guy chose the horn and blew it but this only served to awaken the sleeping knights who made to attack him causing Sir Guy to faint. Apparently the knight awoke near the ruins of the Gate House totally baffled as to what had happened but he determined to find the sleeping maiden again and so it is said to have become an obsession and that he spent the rest of his life searching the castle for the room in which she had lain and he is supposed to have died a broken man.